María Julia Rossi obtained her BAs at the Universidad Nacional de Rosario and Escuela Nacional de Teatro y Títeres, in Rosario, Argentina, and her PhD and MA at the University of Pittsburgh. Her doctoral dissertation, “Las dependencias. Figuras del servicio doméstico en la obra de Silvina Ocampo, Elena Garro y Clarice Lispector” explores representations of domestic servants and the emotional economy of relationships in literary works by these Latin American writers. In her work, Maria Julia argues that servant figures, understood as dependents on the surface, hold a surprising “secret power” hidden in their apparent invisibility. From an interdisciplinary approach that includes notions of power, class, gender, race, practices of everyday life, and the distribution of the sensible, she sustains that these authors’ singular literary styles surprisingly converge in their depictions of the weak as potential agents of change. María Julia is presently working in a new research project, preliminarily titled “The Best of Both Worlds. The Sur Group and the Invention of the ‘Common Reader’ (Argentina, 1930-1955),” in which she studies marginal literary practices embraced by the Sur Group (which included Jorge Luis Borges, Adolfo Bioy Casares, Silvina Ocampo, and José Bianco, among others). Translations and other endeavors, such as prologue writing and anthologies editing, actively pursued the aim of building a sentimental education. Their aim, never fully acknowledged, was also to forge the aesthetic sensibility of the newly educated public in order to create an adequate reception for their own literary works. The outcome of their efforts was essential for the invention of the “common reader,” to borrow Woolf’s notion, in the Spanish-speaking world. These still unstudied editorial and literary endeavors are the object of María Julia’s current research. Los de abajo. Tres siglos de sirvientes en el arte y la literatura de América Latina [Downstairs, Upstairs. 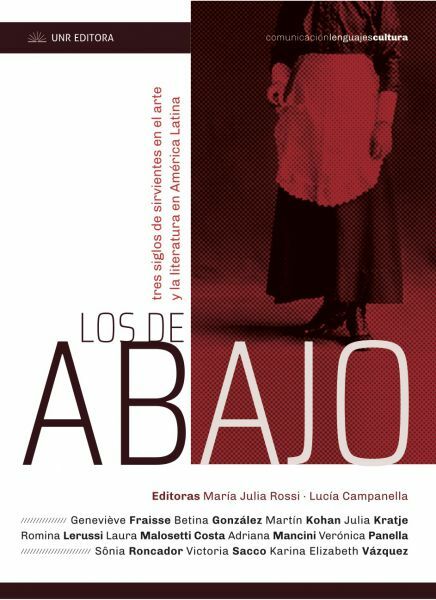 Three Centuries of Servants in Latin American Art and Literature]. Co-edited volume with Lucía Campanella. Description: Collection of twelve essays by Latin American studies scholars whose works analyze servants in visual arts, cinema and literature from diverse perspectives, from the 19th to the 21st century. Rosario, Argentina: Universidad Nacional de Rosario Editora, 2018. “Las diferencias unen y los parecidos distancian. Una lectura de las dedicatorias de Silvina a Victoria Ocampo” [Differences Unite and Similarities Separate. A Reading of Dedications by SO to her Sister V]. Boletín del Centro de Estudios de Teoría y Crítica Literaria 18 (2017): 161-74. “Una ‘fidelidad involuntaria’. Silvina Ocampo y la reescritura” [“Involuntary fidelity.” SO and rewriting processes]. Saga Revista de Letras 7 (2017): 1-22. “Las amenazas de una dinastía espuria. Sirvientes que no sirven en Manuel Mujica Lainez” [The Threats of a Spurious Dynasty. Servants who Don’t Serve in MML]. Cuadernos de LIRICO 16 (2017): 1-18. “‘La identidad imprevisible’: las cartas de Elena Garro en la novela La pérdida del reino de José Bianco.” [“The imprevisible Identity.” EG’s Letters in the novel La pérdida del reino by JB]. Revista Canadiense de Estudios Hispánicos 40.2 (2016): 429-52. “Silvina Ocampo: la identidad desafiada y los dobleces de la infancia” [SO. Challenged Identity and the Duplicity of Childhood]. Hispamérica (2015): 11-18. “Una poética de la incertidumbre: procedimientos erosivos en tres obras de Elena Garro.” [A Poetics of Uncertainty. Erosive Procedures in Thre Works by EG]. Nueva Revista de Filología Hispánica. 62.2 (2014): 515-35. “Los que aman, odian: ¿borrador o reescritura?” [Those Who Love Hate: Draft or Rewriting?]. Revista Iberoamericana 246.80 (2014): 95-110. “‘Hay un verso que está siempre en mi memoria’: derivas de lectura en las reflexiones de Borges sobre la Divina Commedia.” [“There Is a Verse that Is Always on my Memory.” Reading Paths in Borges’s Reflections on Dante’s Divina Commedia]. Variaciones Borges 34 (2012): 67-84. “La voz cantante. Esencia y excesos de las empleadas domésticas en Tania Kaufmann y Clarice Lispector.” [The Singing voice. Essence and excesses of maids in TK and CL]. Los de abajo. Tres siglos de sirvientes en el arte y la literatura de América Latina. MJ Rossi y Lucía Campanella, ed. Rosario: UNR Editora, 2018. 113-33. “Silvina Ocampo and Translation.” Beyond Fantasy. New Readings of Silvina Ocampo. Patricia Klingenberg and Fernanda Zullo, ed. Woodbridge: Tamesis Books, 2016. 173-95. 2018. William Stewart Travel Award For National & International Conferences to attend NeMLA, Pittsburgh, April 12-15, 2018. 2017. OAR Enhanced Travel Funding Program for invited talk at macro (Museo de Arte Contemporáneo de Rosario [Museum of Contemporary Art, Rosario, Argentina]). July 5, 2017. 2017. Summer Collaborative Research Opportunity Grant. Co-PI with Dr. Ria Banerjee (PI). “On the Page and Embodied: Fostering the Revised Taxonomy of Learning through Dramain Two Literature Classrooms”. Eduardo Lozano Memorial Dissertation Prize for the best doctoral dissertation in Latin American Studies at the University of Pittsburgh, 2013-14. Andrew W. Mellon Predoctoral Fellowship 2013-2014, University of Pittsburgh. Cultural Studies Program Fellowship 2013-2014, University of Pittsburgh (declined). Field Research Grant. Project "Writing in the Making: The Reconstruction of Silvina Ocampo and Clarice Lispector's Creative Processes.” Center for Latin American Studies. U of Pittsburgh, 2013. Field Research Grant. Project "Scribbles under the Surface: Latin American Avant Garde in their Drafts and Manuscripts." Center for Latin American Studies. U of Pittsburgh, 2012. Travel Grant. Project "Interviews to Argentine Writers." International Studies Fund. U of Pittsburgh, 2011. Travel Grants for Professional Conferences, Graduate and Professional Student Association, U. of Pittsburgh, 2010, 2011.